When involved in an auto accident or other motor vehicle accident, you can be left not only physically injured but emotionally devastated as well, especially if the collision resulted in catastrophic injuries or the death of a loved one. Dallas car accident lawyer John Polewski understands how difficult the recovery process can be, and he is committed to helping victims recover costs that may be associated with medical expenses, loss of wages, and additional damages. If you have been injured in a car accident in Texas, contact our Dallas-based practice at 972-230-6200 to schedule a free consultation. How Can Our Car Accident Lawyers Help You? If you are involved in an auto accident, our experienced Dallas auto accident attorneys are here to help you in your recovery. After an accident, it is important to remain calm and take the actions needed to obtain vital information. Below is a general list of steps that one should keep in mind after an accident. The safety of everyone that may have been involved is the top priority of any accident. Make sure that no injuries have been sustained. If anyone happens to be injured, you should call for medical assistance immediately. Even if there are no visible injuries, make a point to still get evaluated by a physician for any injuries that may not be evident. When injuries are sustained, you are required to call the police. If no injuries are present, it is still advisable to call the police and file a report. The accident report may be needed for insurance purposes and may also help with your case, as it typically includes the officer's determination of fault. Make sure to get the other vehicle's make, model, license plate, and VIN number. In addition, take down the other driver's name, contact information, insurance information and driver's license number. If there are any witnesses to the accident, make sure to collect their full name and all of their contact information. Witness statements can help to clarify the details with your case. After an accident, pictures can help provide evidence of what happened and assist in determination of fault. Make sure to also photograph and document any scars, bruises, or cuts immediately, as these will heal and proper documentation will be necessary in proving their existence. Always notify your insurance company. You are required to report an accident, even if you were not at fault. 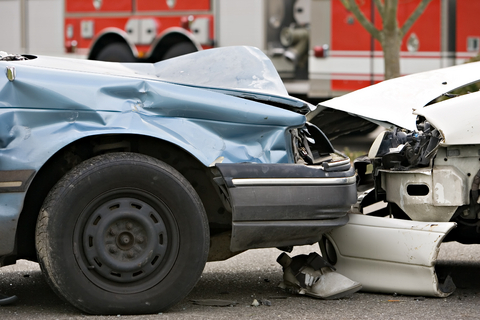 In some cases, a car accident results in mainly damages to the vehicle. Unfortunately many times we see these wrecks result in severe injuries that are not only costly, but require long-term medical care and treatment as well. When it comes to car accident injuries, there are two broad categories: (1) penetrating injuries, and (2) impact injuries. A penetrating injury is commonly a cut or a scrape that is often caused by shattering glass or loose objects in the car that may have hit the driver. Impact injuries occur when a part of the body has impact with part of the car's interior, such as hitting your head against something. Depending on the severity of the injury, certain injuries may resolve themselves without medical treatment, while more serious injuries may leave behind permanent damage. Though all accidents cannot be prevented, following the proper safety precautions can help reduce the risk of a collision occurring. There are thousands of car wrecks every day in the United States. Hundreds of those accidents occur in Texas. In many instances, people have misconceptions about what happens after a car wreck and how car accident claims are handled. "The Accident Was Clearly Not My Fault--So I Can Negotiate a Good Settlement by Myself" This used to be true twenty years ago, but car accident insurance companies have gotten meaner and harder to deal with. Many car accident insurance companies now refuse to offer anything in settlement, or at most only the cost to cover any of the medical care that was needed. The idea that car accident insurance companies will be fair with you is a myth. "My Car Accident Case Will Be Worth a Lot of Money" Unfortunately, often even the best car wreck cases with the worst injuries are worth very little. This is due to a refusal to increase the amount of insurance that drivers must have to cover realistic costs. Even worse are the many cases we see where the driver who caused the accident has no insurance at all, and no money to pay for the damage he caused. Many of our car wreck clients are surprised to find that their own insurance policies may provide extra coverage when the negligent driver has either no insurance or not enough car accident insurance. "Jury's Award Lots of Money in Car Accident Trials" Actually, they don't. In most Texas counties, juries are pretty stingy when it comes to awarding damages for human losses like grief, disability, or pain and suffering. "The Insurance Adjuster is Trying to Help Me" Not if the adjuster works for the other driver's car accident insurance company. Insurance adjusters for the other driver's car insurance company are paid to make sure that you get as little as possible, if anything at all. They are not in the business of trying to help you. "I Will Get a Fair and Quick Settlement" This is perhaps the biggest myth of all. Insurance companies make money by investing premiums paid by their customers, and lose money by paying claims out to people. There is only one reason that a car accident insurance company for the other driver will offer a quick settlement: to prevent you from finding out what your case is really worth. It is common for insurance companies to offer a settlement of 25% or less of the actual value of your case immediately, typically getting you to sign a release preventing you from suing. Fair car wreck settlements are almost never quick. How Can Our Dallas Car Accident Lawyer Help You? At Polewski & Associates, your car accident case will have the personal attention of a board-certified trial lawyer from start to finish. There are no case managers or paralegals handling your claim - just experienced accident attorneys aggressively and professionally serving your legal needs. We are happy to provide free, no-obligation consultations to ensure that you feel comfortable and only pursue your claim if it has the potential for success. We pride ourselves in honesty and will give you a truthful recommendation on whether or not your case warrants the need for a car accident lawyer to represent you. Additionally, we will work with you on a contingency fee basis, meaning we will not charge you for our representation until we recover compensation on your behalf. Our mission is simply to help you and your family recover the compensation you are entitled to, and we will do whatever it takes. If you or a loved one has been injured by the negligence of another, you may be due compensation. Please contact Polewski & Associates to schedule a free consultation with an experienced Dallas auto accident lawyer. We are committed to helping you receive the justice that you rightfully deserve. Call us at 972-230-6200 to schedule your no-cost consultation today.